The regular season is a little over a week and the Sabres are left with 31 players in training camp. A few players are in the bubble with only two preseason games left to make an impression and earn a roster spot. Sabres coaching and management have decisions to make all over the roster over the next week. The first player who I feel has earned a spot with his play so far is Mikhail Grigorenko. 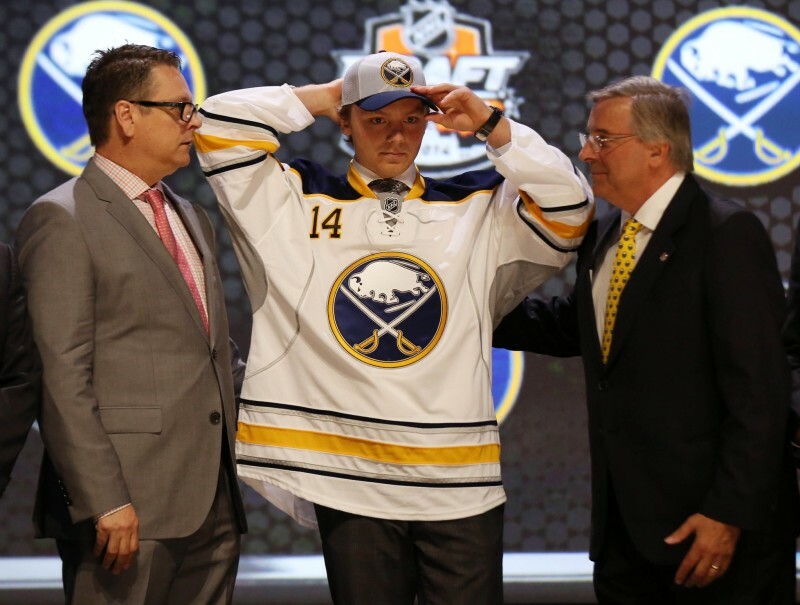 Going into camp the young Russian center was fully expected to start the season in Rochester. However with his new attitude and play, Grigo has caught the attention of coach Ted Nolan. Grigorenko had another strong showing playing on the top line Sunday with Hodgson and Stewart. Playing with two great players he scored a goal and also scored a highlight reel goal in the shootout. The 20 year old forward was all over the ice and played a complete game in his own end. Another bubble player who has a roster spot pretty locked up is Nic Deslauriers. Deslauriers is a young power forward how brings good size and speed. The Sabres picked up Deslauriers from the Kings last year at the trade deadline. The Quebec native has impressed since he arrived in Buffalo last season. He provides great depth on the 3rd and 4th line, along with a strong physical presence. Lastly the young Finnish defenseman Rasmus Ristolainen has locked up a roster spot with his continuous strong performance. Risto has proved he is ready to play at the NHL level. The Sabres have no excuse to return Ristolainen to Rochester. He has proved himself in not only the defensive zone, but he has been a presence in the offensive zone. The future is now on the Sabres blue line. Reinhart may be returned to Kootenay. The 18 year old forward is scheduled to play in the final two preseason games against Washington and Carolina. He’ll be given the full opportunity to make this team. However unless he shows the ability to score or be a playmaker in the final two games, it’ll be likely Reinhart is returned to juniors. when Mark Pysyk returns from his hand injury in the next week. A few players will need to have a strong end to camp in order to earn a roster spot. Players such as Brian Flynn and Torrey Mitchell may be fighting for that final roster spot. Both forwards play a similar role. The Sabres have been high on Flynn for a few years and they like what he brings. Mitchell was slated to be sent through waivers to Rochester as camp opened, however he’s played well throughout camp and earned a look. The final week of the preseason will be fun to watch the battles for the final roster spots.